Whether you want to frame an original painting or print worth thousands of dollars, a handmade textile from South America, a collage of family vacation photos, or a treasured piece of children’s art, we can offer a myriad of framing choices and presentation options to create something special. Our friendly, experienced staff will walk you through the various processes that are available, such as matting, mounting, color palettes, and glass and frame choices. Custom framing can be a simple process of just mounting and framing a poster, to a more elaborate presentation using paper or fabric mats, archival materials for preservation pieces, decorative frames, or more complex techniques such as shadow boxing, build-ups and French matting. Super Special Pricing Option – For a simple approach that typically involves drymounting, glass and framing, Framed in Time offers a package price that provides customers a with a low cost alternative to custom framing based on the size of your art. Give us a call or stop in to see the selection of frames and mats that can be used in this budget friendly option. In-Stock Moulding – Framed in Time has the capacity to stock many different choices of frames within their large facility space. This means we get them at a discounted price from the manufacturer and we pass on that additional discount to our customers. When you come in be sure to ask about our everyday 40% OFF wall. Stop in for a Price Quote – Calling on the phone is not really an accurate method of securing this info, as there are many variables involved and it prevents us from actually seeing the condition and make up of your artwork. The best way to understand the materials and the aesthetics of making your artwork look its best is to stop in and ask our staff to show you some design choices and provide you with a quote. We look forward to meeting you! 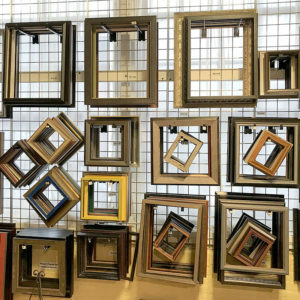 Ready-made Frames – As if the previous choices were not enough to solve all of your framing needs, Framed in Time also has a full wall of custom moulding empty frames in several standard (and non-standard) sizes. We offer these at a significant discount off the custom framing price structure. Customers can bring in their prints, canvases or other works and choose a specialty moulding at a fraction of the price it would be to have that moulding ordered for a frame job. 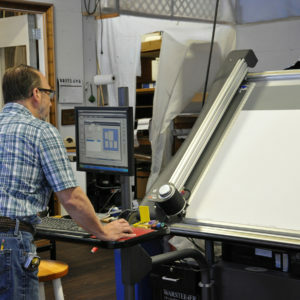 We can then use that frame to complete your project, or you can take it home to complete on your own. Yet another way to SAVE BIG at Framed in Time! Our Expert Team of Craftsmen and Designers exhibit skill sets on many levels with regards to the use of unique materials and methods to mount and design even the most complex works of art. Just to name a few, we create our own French mats to individually enhance your specific piece and we possess the ability to print your artwork or photographs on a selection of giclee quality papers. 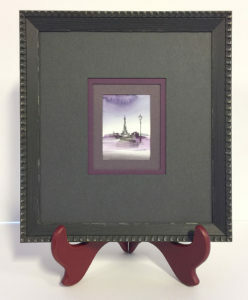 We can combine or layer frames to produce a one-of-a-kind look for your shadow box, or stretch, block and hand sew mount your textiles, cross stitch and other fabric art. We are also experienced and adept at collaging photos, medals, memorabilia and other objects that require delicate and intricate care into a single distinctive presentation. We look forward to guiding you through these processes.